Imagine a fast paced thriller mashed up with a quantum physics book for a layperson. Now throw in family dynamics, a suspensful murder mystery/police procedural, and an unexplainable monster. 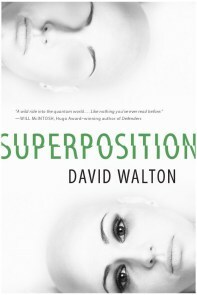 That’s Superposition. Ignore the terrible cover art, this is a pretty good book. For such a short and ultra fast book, I liked how Walton developed the characters, especially Jacob and his family. Through conversations with Jacob’s wife Elena, and their kids, we immediately know a lot about the particulars of their family situation (one of these details becomes incredibly important later). As he spends more time with his daughter Alessandra, it was fascinating to watch him realize he might not be the amazingly perfect father he always thought he was. I won’t go as far to call the book heavy on “feels”, but Walton crams a ton character development into very little space. Other characters too, are quickly given depth – his friend Jean’s marital issues, his brother in-law Marek’s deep seated morals and loyalty. This is a science driven thriller, yet it read like a character driven novel. that’s a good thing. To get the story off and running, Jacob’s old co-worker Brian randomly shows up at his house one night, terrified. Trying to prove a point, Brian shoots Elena, who suffers no ill effects. The next thing Jacob knows, he’s on trial for Brian’s murder. Brian had been alive the evening he shot Elena, found dead the next morning in his lab, was seen alive that afternoon, and then was never seen again. Jacob’s family has also disappeared, will he soon find himself on trial for their murders too?